ABSTRACT. After disasters, treatment of chronic hemodialysis (HD) patients is problematic because of logistic and medical reasons. This study analyzes features of HD practice in the regions affected by the Marmara earthquake that struck northwestern Turkey in August 1999. Questionnaires asking about HD infrastructure, medical/social problems of chronic dialysis patients, and the fate of dialysis personnel after the disaster were sent to dialysis units located in the affected region. Data gathered from eight HD centers that responded to questionnaires were then analyzed. The number of HD centers and machines were 12 and 124, respectively, before the earthquake. The number of weekly HD sessions in the analyzed eight centers declined from 1093 before the disaster to 520, 616, and 729 1 wk, 1 mo, and 3 mo after the earthquake, respectively. In the effective seven centers, the number of HD personnel was 112 before the earthquake, which dropped to 86 and 94 1 and 3 mo after the disaster, respectively. Overall, there were 439 patients in the analyzed eight centers before the disaster, whereas data were provided on 356 (212 were male; mean age, 47.6 ± 15.1 yr) dialysis patients. Six patients died, and seven were seriously and 28 mildly injured by the direct effects of trauma. The percentage of patients who received once-weekly dialysis increased from 2.3 to 7.2% within the first week, with a return to lower figures (4.1 and 2.8%) 1 and 3 mo afterward. Despite a decrease in the number of HD sessions, interdialytic weight gain decreased 1 wk after the disaster and BP measurements did not change significantly before and after the earthquake. A total of 301 and 31 patients left their dialysis centers, temporarily and permanently. After catastrophic earthquakes, despite a decrease in the number of HD sessions, patients comply with disaster conditions, likely by strictly following dietary and fluid restrictions. HD practice is almost always performed in hospitals or in dialysis units, which can be damaged by the earthquakes (2,5,6⇓⇓). Dialysis is a complex procedure that requires urban facilities such as water, electricity, and communication possibilities, which are also prone to be damaged by disasters. Disposable dialysis items (dialyzers, lines, needles, concentrates) may be destroyed or lost, and distribution of these items may be problematic as a result of transportation problems. Acute renal failure as a result of crush syndrome is very frequent after disasters (7), and these patients also need dialysis; thus, the capacity of the dialysis facilities can be overwhelmed. Dialysis personnel and their families are prone to be victims of the disaster themselves (5,8⇓); hence, available facilities may not always work efficiently. Therefore, problems in maintaining regular treatment of chronic dialysis patients may result in fatal complications, especially as a result of hyperkalemia and volume overload (5). All of these issues were considered by the Turkish nephrologists during the catastrophic Marmara earthquake that struck northwestern Turkey on August 17, 1999. According to the official reports, the disaster caused 17,480 deaths and 43,953 wounded (9); locally estimated mortality was even higher. Approximately 600,000 people became homeless, because 133,683 homes were partially or completely destroyed (9). Not surprising, the aftermath of the disaster was characterized by the destruction or disorganization of most of the urban facilities such as hospital infrastructure, telecommunication, electrical power, and water supply in the affected cities (10); therefore, numerous problems were encountered in the treatment of chronic dialysis patients who were domiciliated in that region. This study aimed to analyze HD practice in the affected area as well as the fate of chronic HD patients and personnel after the Marmara disaster. Six months after the earthquake, questionnaires were sent to the hospitals and dialysis facilities that were located at the epicenter or close surrounding area. The questionnaires consisted of six pages. The first (introductory) page defined the methods, and each of the remaining five pages contained tables that comprised multiple cells, each of which were assigned to a clinical or a laboratory parameter. The second page included queries about the number of HD personnel (doctors, nurses, and other personnel), HD machines, the status of water treatment systems, and status of the buildings before 1 and 3 mo after the disaster. The tables on the third page asked about the type and outcome of physical trauma to the HD personnel themselves or their family members caused by the earthquake. The consequences of the trauma were classified as death or severe or mild injuries. Also, injuries to their properties (homes or private offices) were included in this page. The fourth page provided tables asking information about dialysis practices before and 1 wk and 1 and 3 mo after the disaster. In these cells, the number of patients and dialysis sessions as well as the frequency of once-, twice-, and thrice-weekly dialysis were investigated. Also, information about temporary or permanent trafficking of patients was considered. The fifth page provided queries about personal injuries to dialysis patients and their family members such as spouses, children, and parents. Again, consequences of the physical trauma were classified as death or severe or mild injuries. The fate of their properties was also considered. The last page considered demographic and medical information (identity, age, gender, primary disease, and duration of dialysis) for each patient as well as technical features of dialysis practices such as interdialytic weight gain, mean predialysis BP, and other systemic and psychiatric complications before and 1 wk and 1 and 3 mo after the disaster. Data were entered into an SPSS database, version 8.0. Descriptive statistics for all numeric variables, including means, medians, SD, and minimum and maximum values, together with the proportions of all categorical variables were calculated. Nonparametric tests were used while analyzing structural features of the dialysis centers, because the number of centers was small. These tests were also used in the statistics considering interdialytic weight gain, because the distribution of the variables was not normal. Parametric methods were used in all other analyses. Friedman nonparametric variance analysis was used when comparing the medians before and after the disaster. When there was a global difference between the medians, the figures before and after the disaster were compared pairwise by using the Wilcoxon test. Repeated measures ANOVA was used when comparing the means before and after the disaster. When there was a global difference between the means, pairwise comparisons were made by using post hoc analysis with simple contrasts. Statistical significance was accepted at P < 0.05. In the three cities close to the epicenter, there were 12 HD centers, which were equipped with 124 HD machines (9). Five of these facilities were heavily damaged by the disaster. The cities, number of dialysis centers, and number of dialysis machines before the earthquake were as follows: Izmit, seven centers and 72 machines; Adapazari, three centers and 33 machines; and Yalova, two centers and 19 machines. Among these facilities, eight responded to the questionnaires, four of which incurred severe structural damage and subsequently did not treat any patient within the first week of the disaster (Table 1). One of these centers began to work 1 mo after and another 3 mo after the disaster, because technical examination of the buildings did not reveal any risks of further damage in the case of aftershocks. Conversely, one of the dialysis centers with originally minimal damage, which continued to treat patients within the first weeks after the earthquake, was damaged heavily during one of the aftershocks and was closed 1 mo after the original disaster. Another center, which was damaged very heavily during the disaster itself, was closed definitely from the very beginning. In the eight centers submitted to analysis, there were 95 HD machines before the disaster, whereas the figures were 74 and 79 1 and 3 mo after the earthquake. There were 112 HD personnel, including doctors, nurses, and technicians, before the disaster. Considerable decreases were noted 1 and 3 mo after the earthquake (Table 2). One of the dialysis doctors died during the disaster. Considering injuries to the family members, among the two children of another doctor, one died and another one was severely injured. Also, parents of an HD nurse died. Overall, two severe and 16 mild injuries were described in HD personnel. Considering damage to properties, 16 homes of personnel totally collapsed, and another 10 cases of severe damage and 12 cases of mild damage were reported. The number of HD patients before the earthquake was 439 in the eight centers; their number declined to 175, 239, and 288 1 wk, 1 mo, and 3 mo after the disaster, respectively (Figure 1). Among these patients, six died by the direct impact of trauma. Two patients lost their spouse, and five lost one or more children. Twenty-eight patients’ homes collapsed almost completely, and severe damages were noted in 26 and mild damages in 28 homes. Figure 1. The number of hemodialysis (HD) sessions and patients on maintenance HD in the analyzed eight centers before and 1 and 3 mo after the disaster. Overall, P = 0.04 for both the number of HD sessions and HD patients. 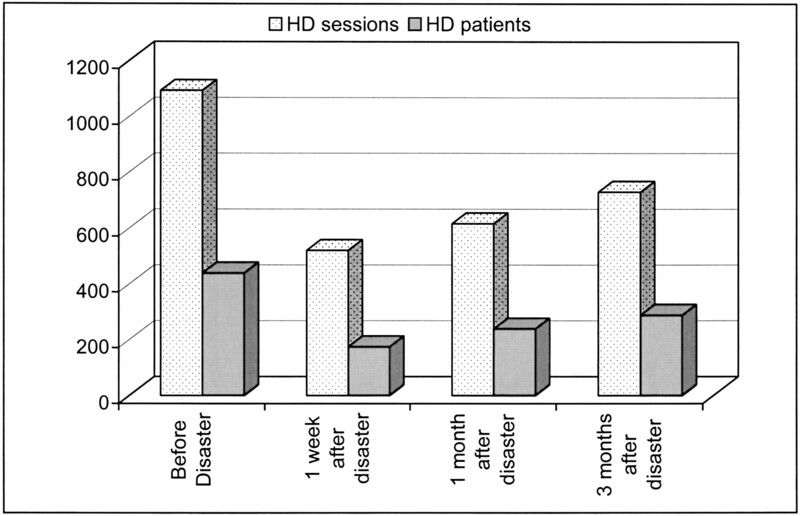 Comparison between before disaster and 1 wk, 1 mo, and 3 mo after the disaster was NS for both the number of HD sessions and HD patients. Many of the patients moved to other dialysis centers in the aftermath of the disaster. Considering temporary traffic, 133 continued treatment in stronger or prefabricated dialysis buildings in their original cities, and 168 moved to other cities of Turkey (61 to Istanbul, 27 to Ankara, and 80 to other cities). Thirty-one patients permanently left the cities where they had been living and continued their life in other towns of the country. The eight centers that responded to the questionnaires reported information on 356 patients (212 were male, 144 were female; mean age, 47.6 ± 15.1 yr [range, 16 to 78]). Data were not provided about 83 patients very likely because many of these patients had moved to other dialysis centers either temporarily or permanently or even had died during the disaster, without information to the HD centers. The number of patients who were treated per particular center showed considerable variation in the aftermath of disaster. There was a drop in the number of patients who were treated in some mildly damaged centers, because many patients were anxious about receiving dialysis in those buildings and worried about further damage in the case of future aftershocks. On the other hand, in a very well-constructed and prefabricated brand-new dialysis unit, which just started working before disaster, the number of patients increased from 10 to 112 within the first weeks of the disaster (Table 1). In this facility, the number of HD shifts was increased from two to four to cope with the patient load. Before the disaster, the total number of HD sessions in these eight HD centers was 1093 per week; this figure declined to 520 1 wk afterward. The figures increased again up to 616 and 729 1 and 3 mo after the disaster, respectively (P = 0.04; Figure 1). 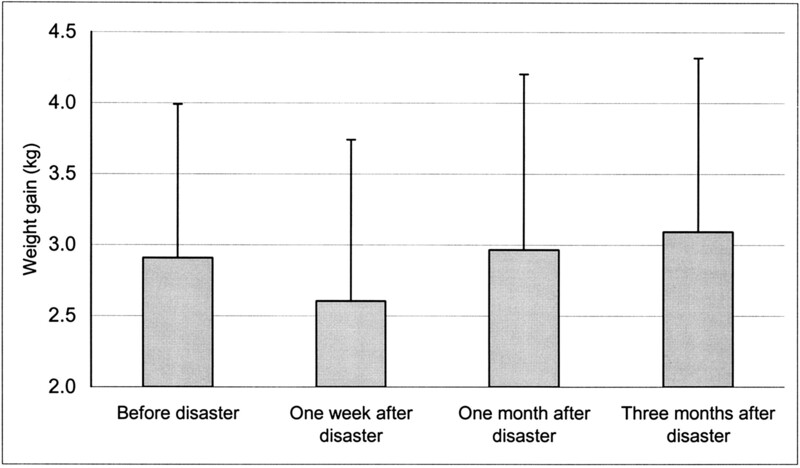 The percentage of patients who were treated once weekly was 2.3% before the earthquake; this figure increased to 7.2% within the first week and then again decreased to 4.1% 1 mo later and 2.8% 3 mo afterward (Figure 2). Figure 2. 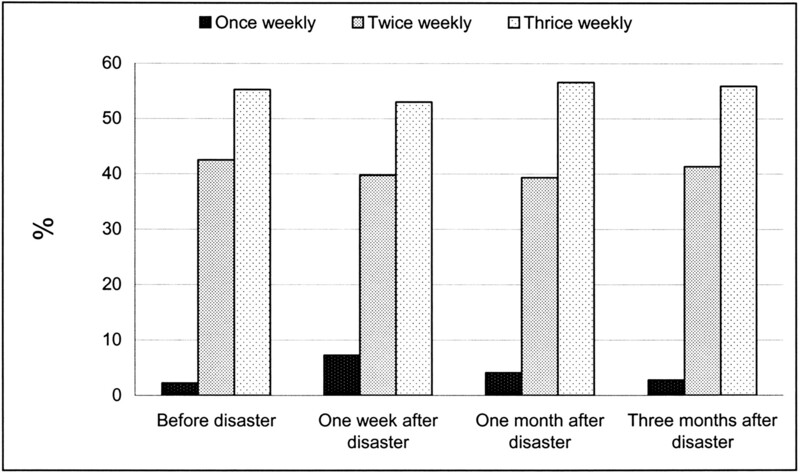 The percentages of once-, twice-, and thrice-weekly dialysis before and 1 wk, 1 mo, and 3 mo after the disaster. Mean number of HD sessions per week was 2.62 ± 0.68 before the disaster; this figure declined to 2.46 ± 0.70 1 wk after the disaster and then again rose to 2.62 ± 0.72 and 2.67 ± 0.75 1 and 3 mo after the earthquake, respectively (P < 0.0001 before versus 1 wk after the disaster). Predialysis systolic and diastolic BP measurements were similar before and after the disaster (Table 3), although differences were noted when the readings were grouped in different BP strata. Mean interdialytic weight gain was 2.9 ± 1.1 kg (range, 0 to 6) before the earthquake; this figure decreased to 2.6 ± 1.1 kg (range, 0 to 5) within the first week of the disaster (P = 0.006) then increased again to 3.0 ± 1.2 kg (range, 0 to 10; P = 0.87) 1 mo after and to 3.1 ± 1.2 kg (range, 0.3 to 6.5; P = 0.001) 3 mo after the earthquake (Figure 3). The most severe problem encountered in dialysis patients was psychiatric complications. Most of the patients were anxious during the treatments because of the worry of the aftershocks. During one of the aftershocks (which was registered 5.8 according to Richter’s scale), all of the patients who received dialysis in a facility at the epicenter disconnected blood lines by themselves and ran out of the dialysis building, with profuse bleeding from the lines. Treatment of chronic dialysis patients is problematic in the aftermath of catastrophic disasters for both logistic and medical reasons. Reports on the fate of dialysis infrastructure after earthquakes are scarce. In the aftermath of the well-described devastating Kobe earthquake, among the 58 dialysis facilities located in the affected area, two were completely destroyed, four were halfway damaged, and 32 were partially damaged (8). Similar problems were also observed after the Chi-Chi earthquake in Taiwan in 2001, and many dialysis centers incurred various degrees of damage (5). Apart from the structural damage to the dialysis buildings, performance of HD machines is not adequate in disaster conditions. Even in the unaffected centers, many of the machines cannot work efficiently because of damage to the infrastructure, such as water, electricity, and water treatment systems for those machines with central supplies (8,11⇓). In the aftermath of the Marmara earthquake, almost half (five of 12) of the centers were heavily damaged; they could not be used, especially within the first week after the disaster. Even the centers with minimal structural damage could not work efficiently, because the buildings carried a risk for further harm and collapse during future aftershocks; thus, both the patients and the dialysis personnel were anxious about entering these facilities. Another reason for inefficient dialysis after disasters is logistic problems related to medical personnel. In the aftermath of the Kobe earthquake, it was reported that attendance of all medical personnel was severely affected. During the first day of the disaster, only 58.4% of the doctors, 35% of the dentists, 44.2% of the nurses, and 31% of the clerical employees were present (12). This was simply because of transportation difficulties and, more important, injuries to the medical personnel themselves or their family members. In this disaster, among the 960 medical professionals engaged in dialysis treatment, two were killed, four were severely injured, and >100 had a member of their family killed or injured (8). Also, homes of 88 and 107 personnel were totally collapsed and partially damaged, respectively. In the present series, the number of HD personnel also dropped considerably (Table 2). Earthquake-related deaths and injuries among these personnel members themselves or to their families as well as damage to their properties had contributed to this decline. Furthermore, migration of some of these personnel to other cities also might have played a role. Therefore, experience gained from previous disasters as well as from the Marmara earthquake shows that after disasters, dialysis staff should be prepared to cope with a larger number of patients with a restricted number of dialysis personnel, as compared to the predisaster period. This concern also indicates that every dialysis unit in disaster-prone areas should prepare in advance its own detailed rescue program. In the aftermath of earthquakes, direct effects of catastrophe on chronic dialysis patients are another concern. These patients can be more prone to earthquake-related mortality because, as a result of physical disabilities, they cannot leave the buildings as fast as other people and, also when buried under the rubble, as a result of coexisting medical problems, they can be expected to have a higher risk of mortality before being rescued. In the present series, the number of chronic dialysis patients dropped from 439 to 175, 239, and 288 1 wk, 1 mo, and 3 mo after the disaster, respectively. Among these, only six were reported to be killed by the direct effect of trauma; the fate of other patients is obscure. It is possible that some of these patients might have moved to other cities, and many others also might have died by the direct impact of trauma; however, dialysis facilities were not informed. This is likely because, in the first days after the disaster, as a result of logistic concerns, many dead victims were buried in common graves even without identification. Secondary to problems in dialysis facilities and infrastructure, considerable difficulties in treatment of still surviving victims is usual (4); thus, inadequate dialysis can result in complications of uremia and even death after disasters (5,13⇓). For a practical solution, it can be suggested to dialyze at least some of the patients once weekly, to treat more patients per dialysis machine, which was also the practice during the Marmara earthquake. The percentage of once-weekly dialysis was 2.3% before the earthquake, whereas this figure increased to 7.2% in the first week. Of course, this policy carries the risk of inadequate dialysis and related complications as well. However, interesting enough, despite less frequent dialysis, interdialytic weight gain did not increase when compared with the predisaster period. In accordance with this observation, BP of the patients did not differ before and after the disaster. These results can be explained by increased compliance of the patients with the dietary and fluid restrictions, probably with the worry of not being able to reach to dialysis treatment in the coming days. Thus, disaster preparedness programs should clearly point out that dose of dialysis can be reduced safely, at least for limited durations. This goal can be achieved by either decreasing the number of weekly dialysis sessions and/or shortening each of the sessions; subsequently, new openings might be created for new acute patients as well as for chronic patients transferred from other dialysis units. Because staff capacity is limited in disaster conditions, predisaster plans should include detailed scenarios on how to obtain maximum efficiency from each of the attending staff members. Another temporary solution for shortage of dialysis facilities can be to transfer the patients to other functioning dialysis centers in the region or in the neighboring cities (5), although the latter may also be problematic as a result of paralyzed communication and transportation difficulties (6,14⇓). In the aftermath of the Marmara earthquake, 30% (133 of 439) of the patients continued their treatment in functioning dialysis centers of the region, whereas 7% (31 of 439) permanently moved to other cities of Turkey. In the case of transportation problems, both acute and chronic renal patients become candidates for limited dialysis facilities. In this case, initially, weekly dialysis numbers of chronic patients should be decreased, because, as was noted above, chronic dialysis patients tolerate well temporarily reduced doses of dialysis. In an extreme situation, if chronic patients cannot further tolerate decreased dialysis and if the physician needs to make a choice between acute and chronic patients, then treatment priorities should be given to acute patients, who are candidates for a healthy life, if they can survive their critical condition. Taking into account all of these logistic and ethical problems and also for preserving emergency dialysis positions for the crush victims of the disaster, it is of vital importance to avoid dialysis treatments in the hospitals in the quake-hit area as much as possible (8). During the Marmara disaster, surprising is that only minor problems were noted in reaching original vital medications of dialysis patients. Conversely, problems were encountered in laboratory follow-up of dialysis patients, mainly because (1) some dialysis units’ laboratories or their equipment were damaged by the disaster, (2) attendance of some laboratory technicians was affected by the disaster, and (3) there were problems in obtaining laboratory chemicals for analyses. Thus, even the patients who found the opportunity to receive dialysis in the affected cities experienced logistic problems and could not receive ideal follow-up. Another important problem in disaster conditions is to collaborate with the patients, for both medical/psychologic and logistic reasons. Thus, experience gained after the Marmara earthquake dictates that instructions dedicated to patient education in disaster conditions should inform the patients about omitting one or even two sessions of dialysis per week, which might be tolerated without problems if a strict fluid restriction and an emergency diet policy is followed. During preventive educational courses, the patients should be instructed not to panic in the case of a disaster if their unit is somehow affected. It should be suggested that they seek alternative, efficient, in-city dialysis facilities or, if they have the opportunity to leave the disaster area, to move to alternative areas as soon as possible, to continue dialysis there at least for a limited period. Considerable problems are encountered in the treatment of chronic dialysis patients in the aftermath of disasters. Because most of these problems result from damage to facilities, constructing strong prefabricated dialysis centers in earthquake-prone areas is of vital importance. A detailed disaster preparedness strategy, which provides plans for coordination of HD centers for back-up dialysis, can maximize the efficiency of renal care. Also, despite that no problems were described as a result of inadequate dialysis in the present series, chronic dialysis patients who live in disaster-prone regions should be educated energetically to comply with catastrophe conditions. It should be recommended to patients that they follow fluid restrictions strictly as well as avoid food rich in potassium. Last, to store potassium exchange resins in their homes can be a useful measure to prevent risky hyperkalemia, in case dialysis treatment cannot be reached, especially in the first days of the disaster.